Well Thanksgiving is less than week away and while here in Greece it is not really celebrated apart from some hotels offering Thanksgiving dinner buffets, at our home we do celebrate it. Our Thanksgiving takes place on the Saturday after Thanksgiving with turkey and a mix of traditional Thanksgiving dishes and Greek dishes as well. One of my favorite ingredients is of course pumpkin. I like anything made with it. 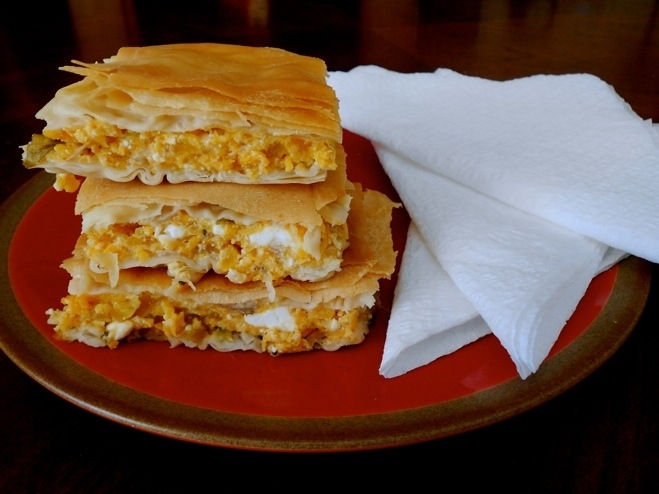 Pumpkin pie comes to mind, but if you would like to try something different this Greek savory pie won’t disappoint. The sweetness of the pumpkin with the spicy feta makes a perfect combination. 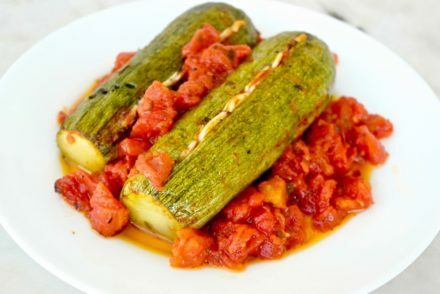 While pumpkin is not typically associated with Greek cuisine, they do have several recipes for this versatile vegetable: obviously Greek pies, patties, preserves (gluko koutaliou) or they may marinate it in vinegar and use it in a salad. 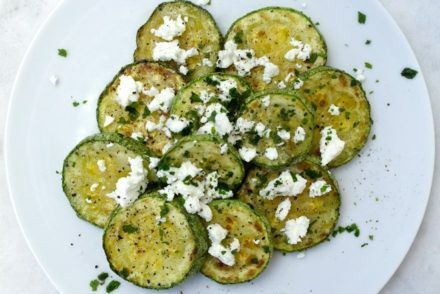 Just to clarify, Greeks call pumpkin glikia kolokitha (sweet pumpkin), but they also call zucchini kolokithaki. 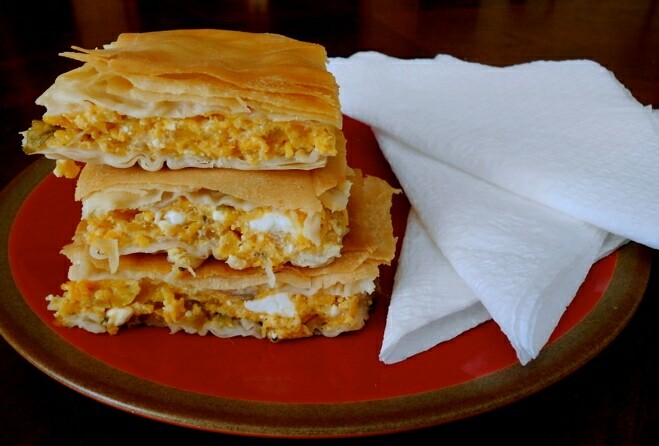 So kolokithopita may be a pie made with zucchini or pumpkin but today I’m sharing a traditional recipe made with “sweet” pumpkin, feta cheese and phyllo. Yes it is the same concept as spana-kopita (spinach pie) and tyro-pita (cheese pie). Pita means pie and can be sweet or savory, although they are usually savory. This pita is fairly simple. You do not use pumpkin puree as you would for a typical American pumpkin pie but the pumpkin is shredded and then heated in a pot until it is soft. I guess you could use ready-made pumpkin puree, but the texture may be different. For this recipe I took small chunks of pumpkin and heated until soft and melted, smashing with a fork, it has a bit of a chunkier result. Obviously shredding the pumpkin will help it cook faster. If you have a food processor, shredding will be quick, otherwise you can cut it in thin slices. For the phyllo, this time I used a bit of a thicker phyllo called horiatiko here in Greece and it has some olive oil in it, but I think I like it with regular phyllo better. Now these pies are better consumed warm, otherwise the phyllo can get soft, you can re-heat but it won’t have the same result. Also for this recipe I made the pita in a big pan which is easier, but for the holidays I would prefer triangle wraps like I did here, I think they are easier to serve and consume. So nutritionally this recipe has a lot going for it, olive oil is the main source of fat here, so you get mostly monounsaturated fat and of course this pita is an excellent source of vitamin A, potassium and carotenoids that are plant pigments that can turn into vitamin in the body and have antioxidant activity protecting from chronic disease. Grate the pumpkin and heat the pumpkin in a pot with no oil and a bit of water. It will release water, keep on heating and mixing until soft and the water has somewhat evaporated. Remove from pot and strain and let cool. In the meantime saute the chopped onion in 1-2 tablespoon olive oil until soft. Once the pumpkin has strained mash until somewhat smooth, mix with the onions. Add the feta, mint and cumin and mix well. Beat the egg in a little bowl and add to the mixture. Mix until all ingredients until well blended. (Do not mix with a mixer). Add salt and pepper to taste. This is the step of assembling the pie, as I mentioned you may choose to do small triangle mini pies, click here for directions. Otherwise you can do the classic way as seen here. Take a pan about the size of your phyllo sheets 9 X 14 inches work well (22 X 35 cm). Grease the bottom and sides of the pan with olive oil. Layer 6-7 sheets of phyllo brushing with olive oil each sheet. If your pan is slightly smaller that the sheets spread them leaving the leftover hanging on the edge. Pour the pumpkin-cheese mix, spreading evenly. Fold over the left over phyllo. Cover with 5-6 phyllo sheets again brushing each sheet with olive oil. Tuck in the leftover phyllo. Score the top phyllo layers in pieces, do not cut all the way through. Bake in the oven at the lower level for about 40 minutes until golden. I did it yesterday for my family, I couldn’t get phyllo horiatiko here in Brazil so I used regular and some local pumpkins called “abóboras” that are very sweet and tasty. It was absolutely wonderful, thanks so much for such a delightful recipe! Thanks! Yes, regular phyllo works fine too. Those aboboras sound good! Besides over-heating the pumpkin into a puree-like consistency (now I know better), the pie was, simply, delicious! Thanks Helene! Glad you enjoyed it! Made it this morning and it disappeared from our lunch table…WOW! What a recipe! Thanks Elena and keep up the good work! Thank you Mary! Glad your family liked it! can you substitute butternut squash? I always use butternut squash, as did my mother and my grandmother after she left Greece. I guess it was easier to get. I shred it and steam it for about 1 or 2 mins before mixing it with sautéed onion and the other ingredients. I also add a little fresh nutmeg. I have had good success freezing them and then put in the oven when I am ready to serve. I have been looking for a recipe as above that my Mother used to make. She called them Bourekia. She made them with pumpkin and onion and sprinkled them with powered sugar. They were in the shape of a jelly roll individually made. I could never find a recipe of hers after she passed on and I have looked in all of my Greek Cookbooks and cannot find a similar recipe. She made her own crust. Did not use filo. Do you know of such a recipe. Hi Dialekti, I’ll look into it. Is it mostly a savory flavor or did the filling have sugar in it too? Hi Elena, Some of my family don’t eat the feta. Can I substitute something for it please? You can omit the feta, and make the nistisimo (vegan) version. If I already have some roast pumpkin puree in my freezer that I want to use how much should I use in cups? 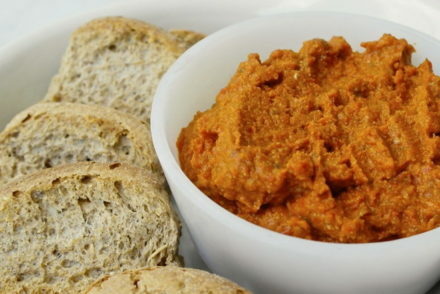 Hi, we (the ladies in my family) have made this a winter staple…using butternut squash (taboura? )…However, we roast the butternut squash (with oil) first. until it is soft, andthen mash it with the egg and feta cheese.